CREATE YOUR EVERLASTING MEMORY HERE ! Cambodian Hospitality Culture has been consistently raising its destination to the top bucket list in every traveller’s minds, especially Siem Reap city where Memoire Hotels & Resorts group originated in. Being one of the top leaders amongst most hotels & resorts; local and international brand, we proudly bring our most admirable hospitality service to create an ultimate, unforgettable experience for you with different tastes. Memoire Hornbill Hotel is the bright new boutique hotel concept designed by the exponential Founding Father of Cambodian Hospitality (FFCH), Mr. Philip Kao, together with the prominent interior designer Yien, which follows the most contemporary hexagons style. Now you can enjoy our friendliest and professional Cambodian Hospitality here. all over Sarawak will meet and preside over debates and passing of laws. Kuching Rivers. It is approximately 40 kilometres (25 mi) by road from Kuching. an English castle, was designed to protect Kuching from attack by pirates. – Free one way private pick up. Offering lavish 49 accommodation units of impeccable designs, experience 24 hours reception service in the hotel main lobby, which is located on the first floor where the full day dining, Grill Wine Café is conveniently located. Our helpful Guest Experience Team is more than delighted to arrange your city tour and other attractive excursions. Just make sure you follow our expert! Tastefully appointed with the most contemporary hexagons style, our 49 rooms gracefully offer a variety of choices tailored to your preferences. From the simplest beautiful URBAN Rooms to the stunning view of our URBAN WINDOW Rooms, and our most spacious and convenient MEMOIRE FAMILY rooms. refreshing hotel landscape art, epitomizing contemporary art and modern comfort. The Spacious and cozy design Memoire Suite projects reminiscent of home away from home. The Infusion Cuisine derived from an Authentic Cambodian Cuisine and Western mythology by the popular contemporary taste. Limit to only 120 chairs arranged in comfortable seating for purpose of ultimate privacy and appetizing all day dining. 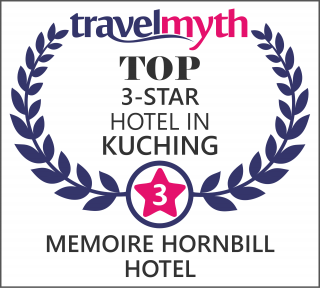 Memoire Hotel Hornbill is perfectly appointed in the central park of third miles, the Landmark of Kuching, Sarawak. It is conveniently accessible to the most vibrant dining venues, from Local to International, and traditional Cambodian to contemporary Western cuisine. It is a revolutionized blend of food ambiance with phenomenal Cambodian hospitality service. The famous Hospitals and Banks are just moments away. Take a short drive from the airport or allow us to fetch you! Jalan Tun Ahmad Zaidi Adruce, 93200 Kuching, Sarawak. One of the fundamental frames of reference for responsible and sustainable tourism, the Global Code of Ethics for Tourism is to protect the children.